This is a fairly new cultivar, with all the charm of an heirloom. 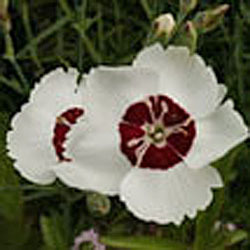 It is low growing, with flat, single white flowers with a dark maroon band. The flowers are strongly scented. Categories: All Items, all potted plants, Notecards, Potted Plants, More..